Aloe Vera and Handy Herbs are so - Handy! Really, aloe vera and handy herbs - healthy herbs - are truly very handy. They are all around us! God has placed pretty well all the pharmacy we're going to need in the plants growing near us such as aloe vera, our house plants, and the weeks beside our sidewalks are really healing huerbs; we just need to learn what we have. You may have an aloe vera plant in the house. You may only think of it when you cut your finger or get a sudden burn in the kitchen, but that plant has many more benefits than you perhaps realize. My Dad loved to tell others how his ulcers and shingles were healed with my aloe vera plants. 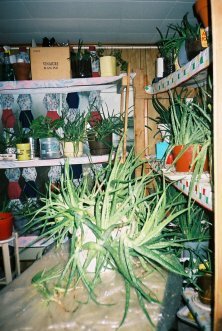 My discoveries about and propagation of a large aloe vera plant received when my grandmother needed nursing care, gradually led to an interest and much reading up on other herbs. Some sound exotic and far away, however, God has generously placed an assortment of healing plants in every part of the world. Jethro Kloss, in his wonderful reference book, Back To Eden , wrote about the many naturally healing herbs and plants he had studied and of which he discovered their healing properties. He shocked me when he said that whatever illness we have, there will be a plant growing in our neighbourhood, perhaps in our own back yard, which is a good remedy for that ailment. Only, we maybe trying to eradicate those plants as weeds, instead of accepting them as our healing herbs - our medicine. I've found him to be right about aloe vera and pretty well every other herb I've looked into and experimented with. Since I read that book in the mid-1980s, after hearing about it from an older woman in the nursing home where I visited my Gra'ma Kroeker, I have tried to find these herbs, harvest them, and see if they do what Jethro Kloss said. It is uncanny how often he is proved right! The time has come - as one woman said, when she came to buy one of my extra large aloe vera plants - for me to share this information with others. I can understand that you don't have time to study Back to Eden and try out Kloss's recipes and references over many years, so on this site I try to distill that information and make it easier to zero in on what you are looking for. When my beloved Grosz'mama began to slip in her memory and had to be moved to our home until there was an opening in the nursing home, I packed and brought the things from her suite to our place, including one fine, healthy aloe vera plant. Dad took a shine to it, and kept it near his reading and dozing recliner in a sunny corner of the living room. That aloe vera plant grew and had babies and got so large that it leaned over beside the pot and kept growing and growing. After Mom died, Dad and I treated ourselves to a holiday trip to British Columbia, (Canada) to visit relatives. There my cousin Myrna and her husband were selling a supplement based on aloe vera. They gave us a set of tapes to listen in the car, and when we heard that aloe vera is safe and healthy to eat, and that it heals of so many things, Dad and I decided to try that as soon as we got home. It didn't take Dad long to finish off the biggest stems of Grosz'mama's old aloe vera plant, but by that time I had transplanted the small wee plants popping up in the pot and the shelves Dad built for me in the south sunroom began to fill up. At one point I counted 75 containers of aloe vera plants! However, in 2007 Dad died at 91, of a sudden and fast lung cancer. I had to dispose of most of those plants because the wee house I moved into simply did NOT have room. The last 30 to 40 aloe vera plants I had kept in the front porch froze that winter, so I'm down to less than 10 pots full. (Yes, I do feel somewhat deprived, but I know that as soon as I have space I can quickly multiply what aloe vera plants I have again). Meantime, I'm learning to find other sources for aloe vera, like other mortals who don't have a room full of large aloe vera plants. I have many more stories, and good information to share with you about individual healing herbs, and about the wonderful aloe vera - which is not a cactus as some say, but part of a fascinating desert lily family from Africa. Use the links to the left and below to read more specific pages. Aloe - Your Miracle Doctor book, covers aloe vera for sunburn! among many other things. Wondering what happens when you eat aloe vera? Take my 9-part e-course to find out. My treat!